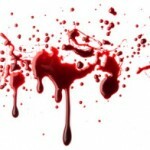 Are Christians infatuated with the Blood of Jesus? 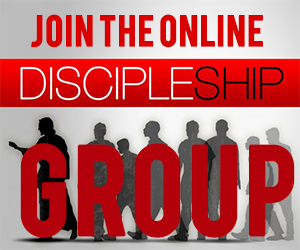 You are here: Home / Redeeming Theology / Are Christians infatuated with the Blood of Jesus? Have you ever listened to some of the songs Christians sing around Easter? We seem to be infatuated with the blood of Jesus. No other fount I know; nothing but the blood of Jesus. These songs have images of a bloody river and a fountain filled with blood drawn from Emmanuel’s veins. Yikes! Some Christian songs sound more like a gruesome and gory scene from a Freddy Krueger movie than from something having to do with Jesus Christ. And what’s this about washing in the blood of the lamb? That sounds an awful lot like some ancient Pagan sacrificial rituals where worshippers pour the blood of bulls, goats, and lambs over their heads. Is this really what God wants from us? To take baths in the blood of Jesus? 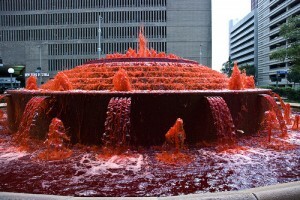 To swim in rivers of blood and dance around in bloody fountains? What is the deal with the blood of Jesus? I fully admit that I used to focus a lot on the blood of Jesus as well. 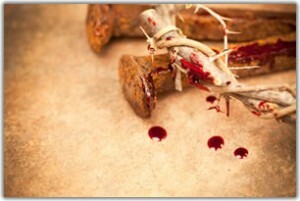 In fact, I once preached a whole sermon about the painful trial and bloody ordeal that Jesus experienced on the cross. But in recent years, I have begun to wonder if all this emphasis on the blood of Jesus, including His suffering and pain on the cross, is what Jesus really wants. Does Jesus want us to focus on the blood He spilled and the pain He endured on the cross? I used to think so, but in recent years, I am not so sure. One of the first things that made me wonder about our infatuation with they blood of Jesus is the realization that the Gospels don’t say much about the blood of Jesus. Similarly, there is hardly any mention about His suffering and pain. 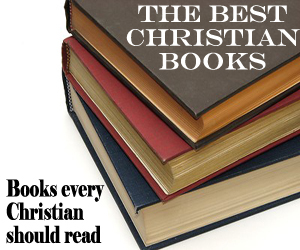 For the most part, the Gospel accounts of the crucifixion of Jesus are fairly benign. They report the details of what happened and what was said, but they report almost nothing about the gruesome nature of crucifixion or the pain that Jesus must have endured. We have scientifically based teachings that walk us through the pain and suffering Jesus must have gone through during the Crucifixion. We make movies that dramatize the flogging and beating He underwent on our behalf. At Easter we put together pageants and invite outsiders to come and watch Jesus get the tar beat out of Him for their sins. We have come to believe that it is God’s heart to hold this moment over the heads of His children in an effort to get them to obey the rules. If we are graphically reminded of the pain and suffering He underwent on our behalf, perhaps we will do our best to repay Him by living a right life. … Imagine if a man broke into my home and was planning on killing my wife and children, but I convinced him to take my life instead of theirs. If he let them escape and then proceeded to take me into a back room and film himself torturing me for hours until finally taking my life, do you think I would ever want my family to see that videotape? Absolutely not! I would want them to remember my life and my love for them. There is nothing inside me that would ever want them to view the pain I underwent to save their lives. That would break their hearts. This is how God feels when we reenact the stations of the cross in an effort to riddle people with guilt and condemnation. It doesn’t motivate; it exasperates. This is not what love desires (pp. 63, 67). He makes a good point, doesn’t he? 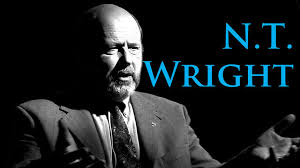 One could argue, I suppose, that the Gospel authors barely mentioned the blood and gore because the original readers of the Gospel accounts were quite familiar with the agonizing nature of crucifixion, and since most of us are not, the details need to be presented. To some degree, I hold to this argument myself, which is why I continue to keep online my study about the pain of crucifixion. Yet at the same time, if we want to truly understand what the Gospel authors were saying, we need to do our best to let them provide the details they think are important, and try to set aside the rest as nothing more than interesting historical side notes. And when it comes to understanding what the Gospel authors are saying about the crucifixion of Jesus, they have chosen to focus very little of their attention on the suffering and blood of Jesus. 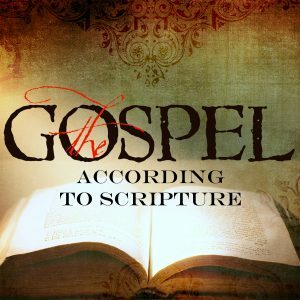 So if we want to understand the Gospels, we should do the same. The blood of Jesus is not that big of a deal in the Gospels, nor is His pain and suffering. I think it’s very important to know what Jesus was willing to endure for our sake. It speaks to the depth of His love and the great need we have for forgiveness. 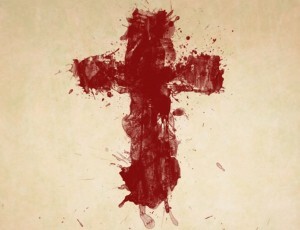 It was His sacrifice, His willingness to give every last drop of His blood, that allows for the cleansing of our souls. But we have not been washed, baptised, cleansed, or in any other way effected directly by His blood. The thought seems somewhat obscene to me. Hmm. Provocative statement there at the end. So you would say that 1 John 1:7 is referring primarily to the cleansing of our souls from sin? Infatuation sounds a bit judgemental. Do you know the thoughts and intentions of all Christians that focus on the blood of Christ? If it’s gore they’re looking for well then go watch some war movie but if it’s because of what the blood of our Lord did, there is absolutely nothing wrong with that. If the NT hardly mentions the blood maybe because when it does it does it in such a concise and powerful way that nothing more needs to be added to it. There are at least 34 verses in the NT that mention the blood so it is important. Christ himself at the last supper said ” Each of you drink from it, for this is my blood, which seals the covenant between God and his people. It is poured out to forgive the sins of many.” Also Acts 20:28 …which he bought with his own blood, Col.1:20 …by making peace through his blood shed on the cross, Ephesians 1:7 In him we have redemption through his blood, Heb. 9:14 how much more, then, will the blood of Christ…cleanse our consciences from acts that lead to death, Heb.9:22 In fact, the law requires that nearly everything be cleansed with blood, and without the shedding of blood there is no forgiveness, 1 Jn.1:7 … and the blood of Jesus his son cleanses us from all sin. These are just a few and notice how precise they are, sounds pretty important to me. Unless I misunderstood you, you may be steering Christians down a wrong path. The blood should always be emphasized because it’s important and without it we wouldn’t even be having this conversation. It’s what brings us together as one in Christ Jesus. Paul, excellent point. I don’t understand that either. I have heard people plead the blood of Jesus over cars, jobs, sicknesses, debt, and a whole host of other things. You are right, it is like a magic spell for some people. “His blood” cleansing us refers, I believe, to the sacrifice He made. Sacrifices were offered for sins from the beginning but, due to sin in the world, they were flawed and could only cover the sins. A perfect, flawless sacrifice was neccesary to eliminate the stain of sin completely. Jesus was that sacrifice. Not helpful Dean. Do you have an arguement to make ? You are right that Father was satisfied but NOT because Father would require blood and death of an innocent Son, but because Father’s and Son’s love is so great that it was willing to endure and sacrifice everything, even to die undeservingly and unjustly, in order to show us that love. Facts are the same (Jesus shed His blood and died) but the VIEW of it is different: 1st view is religious and somewhat mystical (“God requires blood”), 2nd one is: LOVE is ready to suffer utmost agony and injustice to demonstrate it is truly love. But the Law – which is not for the just!- required blood. God as the ultimate Just One did NOT require Jesus sacrifice for HIS SAKE. 1st Peter 3:21 “And this water symbolizes the baptism that now saves you — not the removal of dirt from the body, but the pledge of a clear conscience toward God. It saves you through the resurrection of Jesus Christ.” We should look to the WHOLENESS, death AND RESURECTION. We should not stop at death. The blood of Jesus cleanse our consciense today, right. How? And what blood, blood that is shed and leaks out of the body, resulting in death? OR the blood that flows through the body of the LIVING organism-which we are NOW in RISEN Jesus. I believe is the 2nd view on blood that is correct NOW- because He indeed died- but NOW He is alive. We should concentrate on the now, on the current thing, “LIFE is in the blood”. If we have fellowship with Him -koinonia- we SHARE with Him…. NOW… LIFE… “I WAS dead-but I am alive…” God gave earthly things as a reminder of spiritual ones (new birth, promised land etc.) Let’s see the function of blood in the living organism: the major one is TRANSPORTING of a) oxygen and carbon dioxide between the lungs and rest of the body, b) nutrients to the body, c) Waste products to be detoxified or removed by the liver and kidneys … See the picture? Sure Matthew…the problem is that we sit in the pew and listen week after week, and never search out the things that are spoken from the pulpit, most people take it hook line and sinker. We are still of those that need spiritual milk in most cases in our churuch, never growing up, because most of the stuff coming out of the pulpit is prepared for the masses. And sometimes even when someone does speak up about things happening in the church whether spiritually or otherwise they are usually silenced in some way. 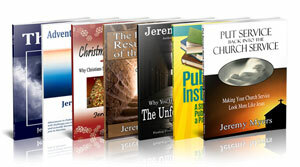 I do not limit my beliefs to those given from the pulpit. 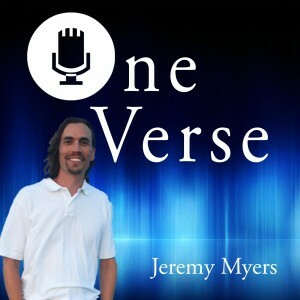 I agree that many churches have placed limits on which parts of His word to teach. This is unfortunate in that people are being given a false understanding of who God is and what it means to be a christian. For myself, I attend several bible studies weekly (hosted by different individuals) and read it for myself (perhaps not as frequently as I should). I do not claim to be a theologion or any other sort of bible expert, but I accept that every word in it is true and inspired by God. Matthew…one does not need to be a theologian to study the scriptures with tools, but the right tools are necessary. And though the smaller setting is more personal, bad doctrine can still exist, heck we all have some erroneous doctrines we believe come from God and are really a man’s opinion. An opinion never challenged! But we must study to learn what is of God and what is of man. Heck just dealing with the translational errors is eye opening, and there are many. My thought as I read this post and the comments is of Revelation 12:11. Jesus blood is sinless blood, incorruptible blood, life is in the blood, Adam’s blood passed sin to us, his blood and ours has sin in it, the only thing that can wash that sin away is the life giving blood of Jesus. The blood of Jesus is not an idiom for his death. I agree that pleading the blood of Jesus is not a scriptural teaching, but the shedding of His blood was essential for your salvation. Yes. I overstated the case there a bit. The NT does talk about the blood of Jesus. Those other texts require some explanation as well. I will write a blog post which does so. Stay tuned! Father was satisfied with Jesus sacrifisce but NOT because Father would require blood and death of an innocent Son, but because Father’s and Son’s love is so great that it was WILLING to endure and sacrifice everything, even to die undeservingly and unjustly, in order to show us that love. Facts are the same (Jesus shed His blood and died) but the VIEW of it is different: 1st view is religious and somewhat mystical (“God requires blood”), 2nd one is: LOVE is ready to suffer utmost agony and injustice to demonstrate it is truly love. But the Law – which is not for the just!- required blood. God as the ultimate Just One did NOT require Jesus sacrifice for HIS SAKE. 1st Peter 3:21 “And this water symbolizes the baptism that now saves you — not the removal of dirt from the body, but the pledge of a clear conscience toward God. It saves you through the resurrection of Jesus Christ,” We should look to the WHOLENESS, death AND RESURECTION. We should not stop at death.The blood of Jesus cleanse our consciense today, right. How? And what blood, blood that is shed and leaks out of the body, resulting in death? OR the blood that flows through the body of the LIVING organism-which we are NOW in RISEN Jesus. I believe is the 2nd view on blood that is correct NOW- because He indeed died- but NOW He is alive. We should concentrate on the now, on the current thing, “LIFE is in the blood”. If we have fellowship with Him -koinonia- we SHARE with Him…. NOW… LIFE… “I WAS dead-but I am alive…” God gave earthly things as a reminder of spiritual ones (new birth, promised land etc.) Let’s see the function of blood in the living organism: the major one is TRANSPORTING of a) oxygen and carbon dioxide between the lungs and rest of the body, b) nutrients to the body, c) Waste products to be detoxified or removed by the liver and kidneys … See the picture? To be CONTINUALY cleansed by the blood- BOTH parties have to be alive, the one doing the cleansing, and the one receiving it. Christians should change their focus from death to life. Uhh, aren’t we supposed to remember the body and the blood. The Lord’s Supper…anybody? This site claims to redeem God and rescue Scripture? Yet, they want to ignore the blood of Christ through which our redemption comes? The theological remnants of the Emerging Church. What exactly are we remembering when we remember the blood of Jesus? THAT is the question. I do not seek to ignore the blood of Jesus, but to remember it in its proper context. I think we can understate the blood of Jesus by saying it just means death. I think we misstate the blood of Jesus when we try to make it into some kind if magical incantation (i.e. pleading the blood). Its obvious from scripture that the blood of Jesus had to be shed to accomplish our redemption. Simply staying in the immediate context of 1 Corinthians 11:23-34 Christians are to partake of the table to “proclaim the Lord’s death until he comes” (v.26). We are to remember his work on the cross, his broken body and shed blood. Now, you respectfully stated in your response to me that you want to remember the blood in the proper context however, in your article the thrust of your argument was that perhaps we should not emphasize the blood, not remember it in the proper context. We cannot teach doctrines such as forgiveness, atonement, redemption, sin, salvation, the person and work of Christ, and a host of others without speaking of the Christ’s shed blood. His shed blood accomplished these doctrines in their entirety. It was on the cross where he declared, “It is finished.” Finally, just because the gospels do not give much detail about the crucifixion does not discount the rest of Scripture. The sacrificial system and Passover very clearly point to Christ’s sacrifice and its brutality. Isaiah 53 brings chills. Paul does not shy away from the blood, and Peter also discusses it. In de-emphasizing the blood of Christ we are forced to fill the void by emphasizing something else, usually prosperity, relationships, good works, or miracles. We need to be careful. Praise the Lord Jesus Saints. Our focus maybe not necessarily the F efficacy of the blood but the re education reclassification and putting the right focus on teaching the world about Jesus our father and the Holy Spirit the blood was part of this and explained properly puts this concept in correct perspective. please keep in mind that what we’re venturing into now is new to many people it is important to our task at hand , that we continue carelingly to expose lies or misconceptions and set a precedence for a new and living way to worship God ,that is totally non violent.Bless you all love in Jesus Christ your brother David. First I must say I really enjoy the tunes about the blood. Power in the blood is my favourite. Revelation 5:9 to revelation 5:12 Billions of people and angels singing about the blood of the Lamb and the glory and honor unto Him for the sacrifice. Revelation 1: 5 He washed us with his blood, now i have eternal life thanks to that. Hebrews 9 :22 everything is purified with Blood and without the shedding of blood there is not remissions of sin…….another reason to sing about the blood and give thanks to Jesus for his blood. John 6:54-55 who so ever eat my flesh and drink my blood have eternal life. and more and more and more..etc. etc. etc. It is all about the blood, thank you God for Jesus, thank you Jesus for your precious blood! !